Gandalf rides to Isengard and consults with Saruman in the Tower of Orthanc. After Gandalf turns down Saruman's offer to join him, Gandalf founds himself imprisoned on top of the tower. He is rescued by Gwaihir, Lord of the Eagles. Saruman communicates with Sauron from Orthanc using the Palantir. Later, he accepts the allegiance of the Wild Men and then receives a report from Gríma on Rohan and the arrival of Aragorn and Gandalf. 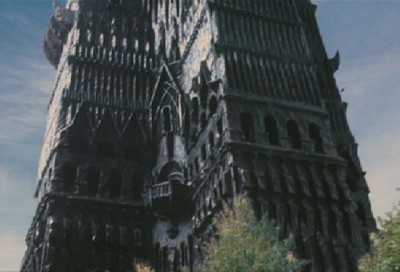 At the end of the film, Saruman finds himself trapped within the tower after the Ents overrun Isengard. Aragorn, Gandalf and others ride to Isengard to find the Ents in command. Gandalf tries to speak to Saruman, who eventually appears, attacks Gandalf, scoffs at his words, belittles Gríma, is stabbed by Gríma and falls from the Tower to his death.